This post is an illustrated explanation of how I wear trainers, or sneakers. As with similar exercises on the blog, I have attempted to be as structured as possible, keeping some parameters constant in order to focus on those being discussed. So in the outfits shown here, we take a single pair of trainers (white Achilles Low from Common Projects), and put them with trousers and knitwear that vary in their material, texture and fit; but not in their colour or pattern (all are plain navy/blue and cream/beige). The first outfit (number 1, below) is a refined casual look. It is what I think trainers such as these were made for, and how I wear them the majority of the time. The other two outfits demonstrate how far I think the shoes can be pushed stylistically in either direction - towards the more formal, or the more casual. They set the limits. Any smarter than outfit 2, and I think you need a classic welted shoe. Any more casual than outfit 3, and you need a more casual trainer. All three maintain the principles we exhort here on Permanent Style - in particular in terms of quality and the primacy of fit. I know a lot of readers still won’t like this. On the surface, it has little to do with bespoke suits and Northampton shoes. But I also know many readers will respond well. Primarily, those that want to dress intelligently but less formally, that are interested in extending their principles of dress to other areas. I hope more conservative readers will still find it an interesting exercise. As a way to reaffirm their own principles, if nothing else. In this outfit, all the items of clothing have a similar refinement of colour, style and shape to the trainers. The trainers are plain white leather. There is no branding, no designer flourishes. The shape is elegantly elongated, with a slightly longer last than most. The clothes are similar. 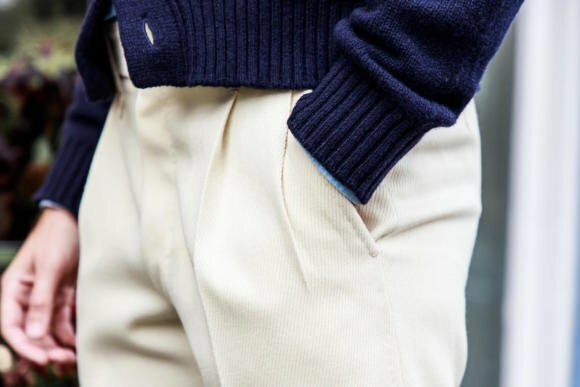 Plain, classic colours of blue, navy and beige. 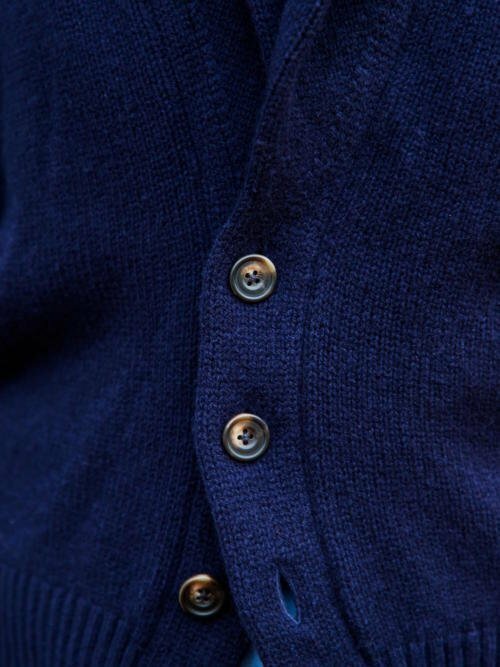 Simple texture-based design in garment-washed cotton or waffle-knit wool. And a slim, neat fit. All of them also share an interest in the best materials, with the aim of ageing well. This is a very simple, versatile look - one Trunk Clothiers has done a lot to promote in recent years. 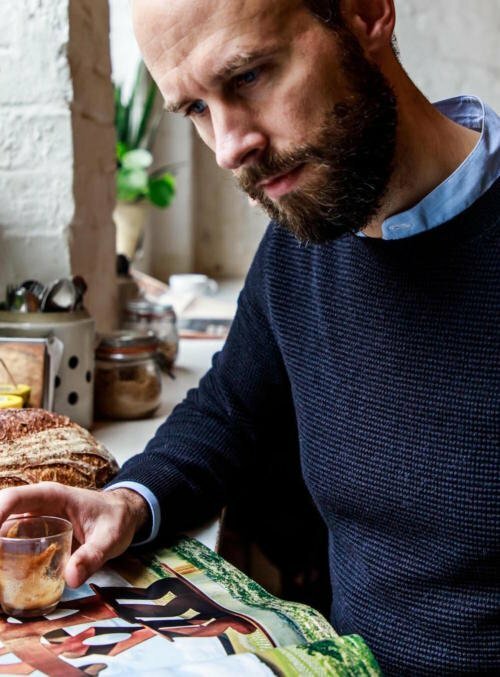 It’s also really useful for anyone looking to dress better in an inherently casual office - taking pretty much the same clothes as everyone else but making them simpler, better fitted and better quality. This second outfit shows the limits of how far I would go to combine trainers with tailoring. First off, no jackets. Personally, I wouldn’t wear a tailored jacket with trainers, no matter how casual and unstructured it is. The closest I would get is knitwear like the Anderson & Sheppard cardigan shown here, which is more sartorial in style - with its close fit, buttoned front and prominent collar. Secondly, and more complicatedly, smarter trousers. These bespoke Pommella trousers in vintage Fox Brothers wool are more formal than the Incotex chinos in outfit 1 by virtue of their material, their cut, and the extra details like the crease and pleats. But they are not that formal. Worsted wool (what most suit trousers are made of) would be too smart for trainers, for instance. And even a woollen such as flannel would probably be too smart. 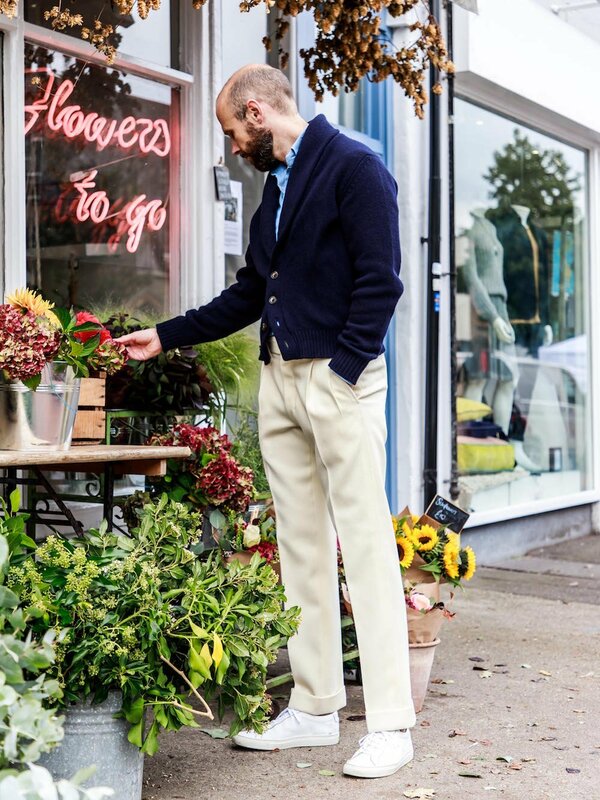 In general, cottons are a safer bet for tailored trousers with trainers. Cotton gabardine in summer, cords or heavier cotton twills in winter. Linen also. Colour also makes a difference - more formal colours like charcoal or navy might be too smart. Overall, this outfit is also more unusual or showy than the first. This comes primarily from mixing pieces that are less similar in terms of style and formality (often referred to as high/low). Unlike the first outfit, where everything was of the same level. For most people, being unusual makes it less suitable for day-to-day wear. But for those that like to be a little more individual, it can be a nice way to express your character. Better to do it in material, cut and combination than with gaudy colours and patterns. This third outfit is perhaps the most casual thing to ever appear on Permanent Style. I’m sure many will dislike it, but it’s worth setting out the few things it has in common with other things discussed on the blog. Most importantly, quality. The hoodie is from The Real McCoy’s, which readers probably know is a Japanese brand that reproduces vintage Americana with fanatical attention to original materials and manufacturing. This piece is a reproduction of an American cold-weather sweatshirt, which is actually two loopback sweatshirts sewn together. This makes it incredibly warm and comfortable. The chinos are from The Armoury, made in a heavy selvedge cotton that wears in much like jeans do, even feathering and fading slightly. Like the best workwear, you can wear the crap out of them - camping, playing in the park with the kids - and they look all the better for it. Fit is also just as much of a consideration as with tailoring, just with different aims. So the sweatshirt sits high on the waist, but is big on the body. It’s a nice style for workwear and very practical. And the chinos are high-waisted (which works with that sweatshirt cut), quite wide in the leg (again, practical) but tapered slightly at the ankle. For me these rugged, practical pieces still work with the trainers because they are simple and restrained in terms of colour and pattern. But the fit and texture are much more casual than outfit 1, and therefore you could argue that a chunkier, stubbier trainer would be more suited - such as Common Projects BBall style, or the CQP Racquet. You can follow the discussion on How to wear trainers: Part 3. Style by entering your email address in the box below. You will then receive an email every time a new comment is added. These will also contain a link to a page where you can stop the alerts, and remove all of your related data from the site. Very informative article, Simon. The context is key here; where are the boundaries between more formal and casual. Outfit two demonstrates this very well, to me those trousers are on the limit with trainers but the cardigan balances the whole. (Superb ganzy by the way – I must get to A&S to look at them.) Question at the end which may address some of the traditionalist element’s queries – to what extent might age determine reaction to this? Thinking of outfit 3 and us slightly more mature individuals who may not look or feel right in a hoodie? Good point Kev, more casual outfits like the end one are perhaps more age dependant. I guess they might also be less likely to be chasing their kids round the park. Skip the hoddie, and make that a Shetland jumper (as mentioned) or likewise, and I’ll be in, despite I’m “older”. No reason why they shouldn’t be chasing the grandkids round the park in a nice loopback sweatshirt (sans hood), though! Great article. I can’t say I am a fan of the 2nd outfit but I think that’s down to the style of the trousers. Otherwise I really like the other 2 outfits especially the APC sweater at the top. You said on the third outfit many will dislike it. Obviously opinions and tastes vary, the beauty of life. But I would like to know what that demographic wear on a Saturday or Sunday afternoon. I don’t believe they are nipping to the shops or whatever in flannels and a tweed blazer. For me it’s the casual outfits where remaining stylish can be more difficult. It is essentially easy to look good in a suit, shirt and tie but putting together a stylish, comfy, casual outfit is much harder. For me I actually would love to see more outfit inspiration like these. You have thousands of articles on tailoring and only a handful on more causal looks. I’m now off to find anywhere still selling that APC top. Thanks, and good point on casual outfits being harder. Personally don’t like the hoodie and so to answer Adam’s question, I’d wear something like outfit 1, though may sub a t-shirt for the shirt. At my age the only place I can wear trainers without risking a ribbing is in the gym, but I really like your APC sweater. On a side not: I prefer trousers with a closer fit in the anklearea to wear with Trainers as in outfit 3. Denim would have worked well too in my opinion. But maybe too far away from your idea to swap texture and but stay in the same colorscheme. Thanks Johnny. So you would set the limits for trainers with tailored trousers further down towards casual than I would. For me, plain-front trousers would be great too, just not at this limit point. And interesting on turn-ups, given they are generally considered more casual than plain bottoms. Denim would also have worked well, I agree. Just more in the safe area and not at this limit. I hope that makes sense – the point about these being at the very limit of what’s appropriate is an important one! There are lots more options that sit between 1 and 3. Reading this series of articles, I have been wondering why always white trainers? Would a similar model in a dark brown leather be more suitable with tailoring, or would it just look like a poor replacement for a ‘proper’ shoe? Would you/do you ever wear other colours of trainers? You’ve hit the nail on the head. The problem with darker trainers is they can look like an attempted replacement for dress shoes. For me, better to stick with things that are least like dress shoes – even bright colours, maybe navy suede. But not classic browns and blacks. On the flip side of that Simon, where do you see those (usually italian) dress shoes with beautiful patinas in green, navy, etc. being used? They look great but I have a hard time picturing them with most, if not all, the outfits I see online and in person. Some colours maybe in suede. It is hard to wear them, and they often end up dictating the rest of the outfit. A green or navy can look good with a navy suit, but only if it’s subtle. I know when I saw Simon’s original article on Common Projects he advised that the off-white were a good choice (and something I have opted for). I personally prefer the off-white to the white. Hi Simon, great article as always. Can I ask where the socks are from? Really like the wool trousers here. I don’t think I can find that cloth on Fox Brothers’ website though. Do you mind giving us the reference number, Simon? It was a vintage piece I’m afraid – no longer available. As with most vintage there were only a couple of lengths available. It was a nice feature of our pop-up shop back in April that we brought these small, vintage pieces up to London. In western Canada, where I live, looks like 1 and 2 would be considered “dressed up”. My off work outfits usually feature blue jeans. So I appreciate this article as I need to replace my current trainers. I still hesitate at pure white ones and have seen some nice ones in shades of light grey that appeal to me. If most of your casual looks featured blue jeans would you still wear your CP trainers Simon? Or would you go for a more “casual” trainer in say canvas? And would a light grey shade be more versatile? No self-respecting adult over the age of 25 should wear sports shoes for anything other than activities requiring them. Let alone hoodies, that should be reserved for children. Most of these outifts would work much better with a simple apir of loafers or a derbies. I fail to undertand what an adult interested in classic style, though I acknowledge your move towards a casual aesthetic, would gain by looking like a PE teacher. If you’re going to wear trainers they should be white only and worn only with jeans in the Summer. Otherwise the trainer look makes a grown man look like he’s trying to recapture his teenage years,a very bad idea. A man needs to dress like an adult and leave the trainer look to the kids. A nice pair of suede loafers will do nicely for comfort and a more casual manly look. I’m gonna go out on a limb here and say what I feel is a fairly important side note: Most men would be fine to wear a high quality hoodie and sneakers as above regardless of age, it’s a question of confidence to a certain point, more so in a higher age I’d assume. However, one thing to consider is one would have to be quite fit in order to pull it off. 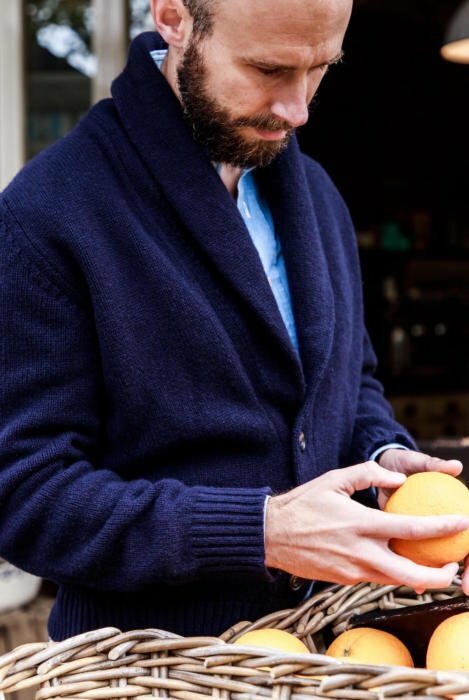 Anyone with a bit of belly and slightly poorer posture would be better off with a Shetland or plain crewneck, but that’s just my two cents. Oh, and that goes for young guys too. Jeans in summer? Maybe where you live. My legs start getting sweaty just thinking about it (portable sauna!). Also, there are enviroments where loafers (as much as you and I love them) would be too distracting for others (startups for example). And you shouldn’t let clothing get in the way of life! Yes sir! Jeans in the Summer work just fine in Europe,the U.S.,and Canada. If others are distracted by our loafers well, there’s an opportunity to discuss why they are so great. I think that comment is a little unfair and outdated. I am in my early 30’s. Whilst I would never go out for a nice meal with my wife, or head out to a cocktail bar or club wearing a pair of trainers (regardless of how normal that is now) I would not think to pull out my cleverley loafers to nip to Starbucks for a coffee. Yes I agree that as you get older maybe should not be wearing your Nike Hurache’s or Blazers after a certain age (or any age for that matter) there is nothing wrong with a pair of CP’s or alike. 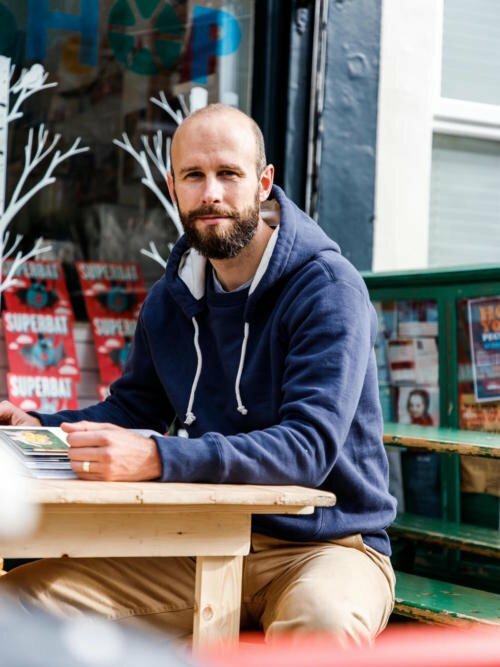 Parker, however much one is interested in classic style, there are times when it is fine to leave the house in sports shoes and/or a hoody, even if one risks looking like a (well paid?) PE teacher. 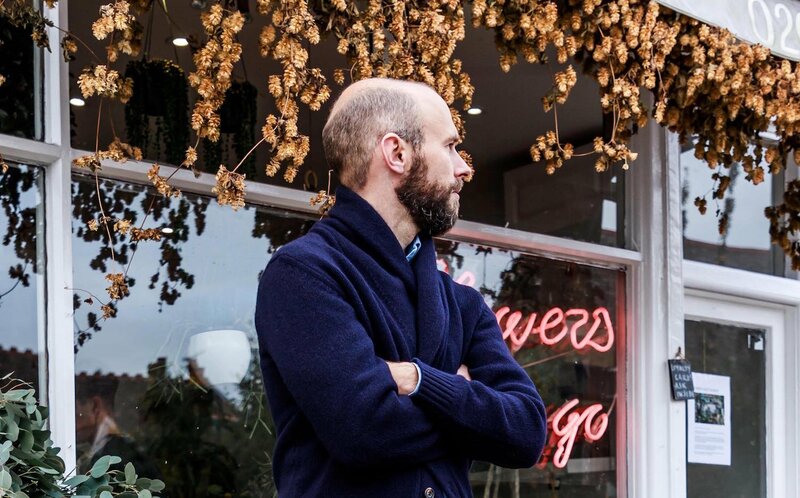 Although I (both self-respecting and over 25) mostly swear by suede oxfords and classic knitwear at the weekends, there are times within that window when I feel absolutely justified in dressing down, e.g. stepping outside the house to grab a coffee/buy pastries or go on a walk with the wife and baby. My go-to outfit would incorporate something like Brunello Cucinelli suede “sneakers” with a Sunspel loopback sweatshirt. I like to think that I avoid looking like a PE teacher, but acknowledge that there are limitations in wearing such an outfit. However, those limitations aren’t that significant – although I would be unable to gain entry into most West End members’ clubs, I wouldn’t feel unable to stick my head into A&S to or pop down to Jermyn Street to place an order for some bespoke shirts. Simon – an unrelated question, but nowhere better to post it I don’t think. Having seen an article online about http://www.communityclothing.co.uk, and the principal (and if I’m honest, price point) appealing to me, I went ahead and ordered their raincoat, which Selfridges are stocking. However on arrival (the pictures didn’t show the coat from the rear) I’ve noticed that it has no rear vent, which I guess is a cost saving measure. Is this very unusual? I’m not at all sure about the lack of one, which is a shame as otherwise it’s pretty nice. Me too! Thank’s for the quick response. Great blog and another thoughtful article. Look 2: perhaps those trousers are a but too wide for CP – maybe a slight taper on the trousers (nothing severe) and the balance would be better. having said that always willing to be corrected! agree with the other post that context is key! I’d say Stòffa trousers were made for these kind of looks. 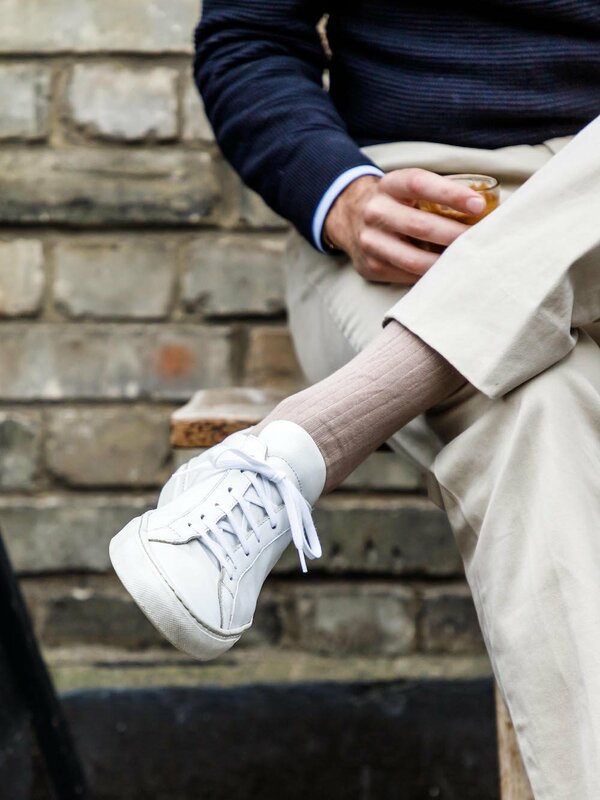 While they can and do look great with Northampton shoes, they’re quite easy to dress down with a sneaker – as their styling often shows. Far too much of your final bow lace on show if I am honest Simon.Still not sure this is an area the high end understands and there is just a bit too much trying too hard here. 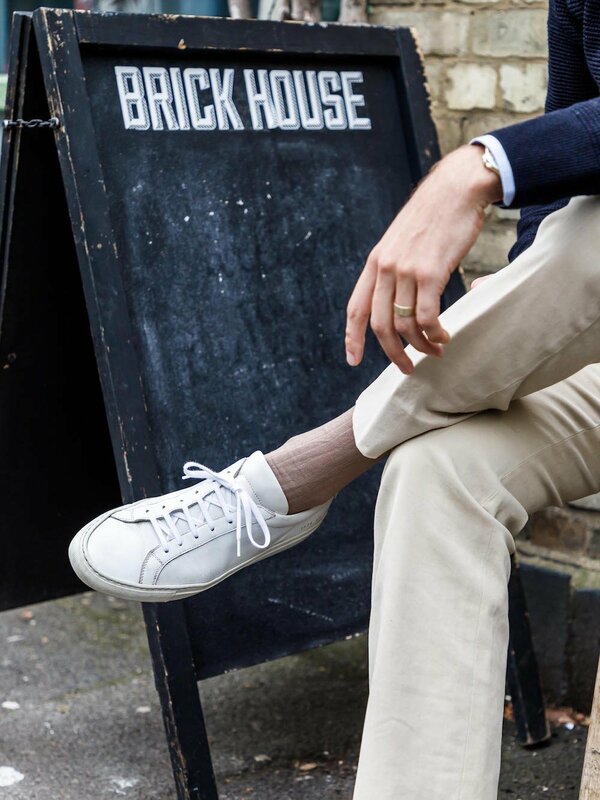 I just think you should relax and consider ditching the common projects and wearing some real trainers . Just my view. Other than this area you know your onions and keep up the good work. Thanks Richard. So you’re saying someone more into trainers would make sure the laces were more evenly tied? I can see that, although it rather goes against your point of just relaxing re the style, perhaps? And here we go again. It’s one thing to declare your preference for tried-and-true standards of dress; it’s quite a different thing to demean, subtly or otherwise, those who might venture beyond that paradigm. Not a few readers on the mature side (whom I salute and respect) manage to express their adherence to classic style without descending into comments on self-respect or fantasies of returning to childhood. Is that so difficult for the rest? That case aside, this is excellent work as usual Simon. The simple yet effective rationales behind each chosen item have become part of your signature journalistic technique. If I remember correctly from other comment sections, you intend to write a review on those exquisite Pommella trousers. I’m certainly looking forward to that. Cheers. Thanks Joseph, yes I am. And I agree entirely on the tone of such comments. I do try to keep out the worst ones. Goodness, there are worse? Rest assured Simon, I believe you are trying your best to keep them out. I can’t even begin to imagine how difficult it must be to balance the website’s openness to reader opinion with consideration for keeping things civil. Social media makes it rather easy to entirely block out other people with contrary beliefs, but you take the high road anyway and that fortitude is laudable. Surely it must get stressful at times? That’s probably a dimension of PS (and blogging in general) that deserves more attention and appreciation from us in the audience. Ah, I think I see what you mean. It can also serve as a bit of self-affirmation that one is able to handle such situations quite well. Here’s to hoping that rewarding feeling follows us in everything we devote ourselves to. It’s ridiculous, but I find very tempting the “sneaker” made by Aubercy. What do you think Simon? Maybe this one you could fathom wearing with a jacket? Haha! I don’t like them, to be honest. It looks too much like a trainer trying to be a dress shoe. Haven’t CPs all got gold branding on the outside near the back? Several of the designers where I work wear them exclusively (often with accidentally identical outfits) and they’re easy to spot by the “subtle” lettering. Finally, pleated trousers! How did we get here? Enjoyed reading this article as I bought a pair of CPs earlier this year before a weekend break to Rome. I never thought to wear white trainers with light colour trousers but this has certainly given some inspiration. I know some sneaker-fanatics who will keep their collection looking as pristine as possible (some carry wipes with them). With this in mind, do you take a view that leather trainers can age well (like a dress shoe can) or best kept looking as new as possible? I don’t understand why anyone would wear trainers anywhere other than an athletic field or a gym. Thanks Simon for such a great article! May I know what size did you get for the Real McCoy sweatshirt? And would you prefer this sweatshirt or the Loopwheeler’s one that you mentioned before? Alright thank you so much! You were right, Simon – I did rather enjoy this article! 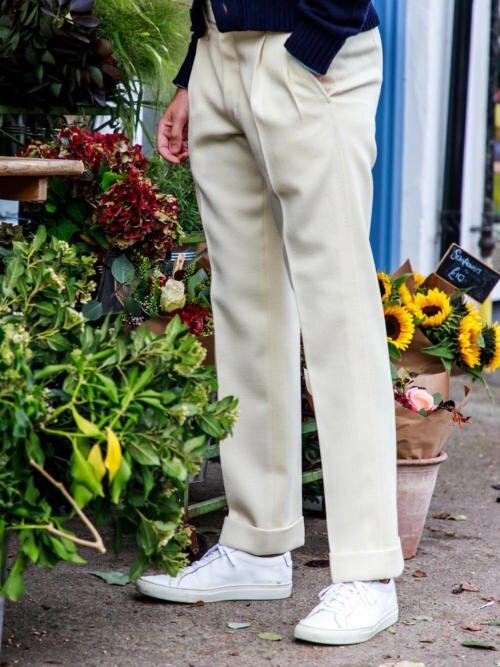 What are your views on pairing tailored linen trousers with trainers in cream/white? Seems to be somewhere between your outfits 1 and 2. I personally think that a more formal trouser material (especially one with a bit of a sheen in its texture) would look out of place with trainers. 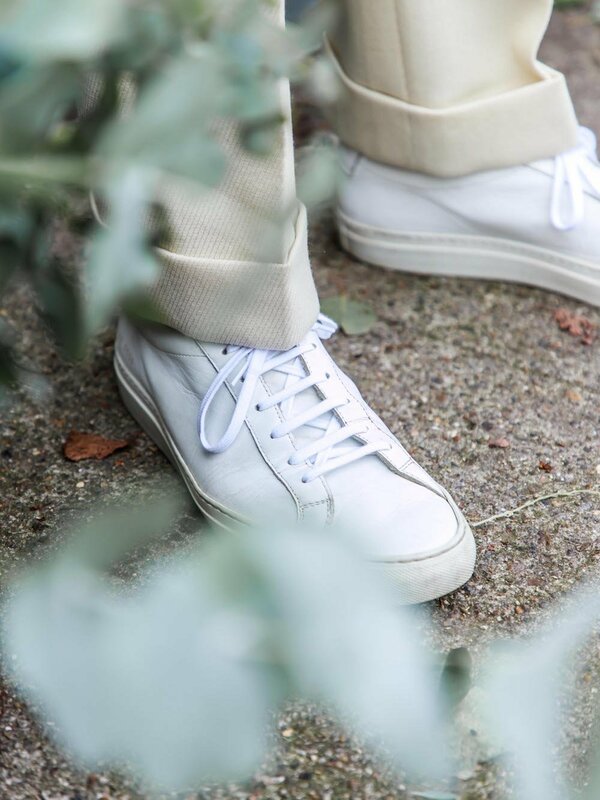 I find linen trousers goes better with canvas sneakers rather than leather. I guess it’s the texture. Interesting point, yes I can see that. I’ve read this post with great interest. But for a reason you might perhaps not expect. Indeed, while musing over how far up one could move sneakers as a piece of wardrobe on the formality scale, I ended up with the idea that you have made a compromise here. I guess you’ve reckoned with the sheer fact that there’s a huge trend towards mixing sneakers with even suits, something one expects you would hardly embrace, to begin with. But how far up could one go with this item? Thus this piece that is truly a compromise with those we see today daring to wear even smart suits with sneakers! And hence these smart trousers you have pulled off! Frankly, I wouldn’t go that far! To me, sneakers will definitely remain within the boundaries of formality wherein jeans, chinos, casual jackets such as Harrington, knitwear such as your wonderful A&S belong to. So alongside the dictate of fashion, presumably the Ivy Style is still anyhow defining our sense of style too. Thanks John, and you’re right that was the spur for the piece. I completely take your point of view – and it should be noted that these examples are gave are of the absolute extremes. Most times I would not wear them, but something safer – like the chinos/jeans and Harrington/blouson combination you suggest. By the way, Drake’s website seems not be accessible from yours. Thanks, I will alert them to the issue. Much enjoyed this piece, thank you. 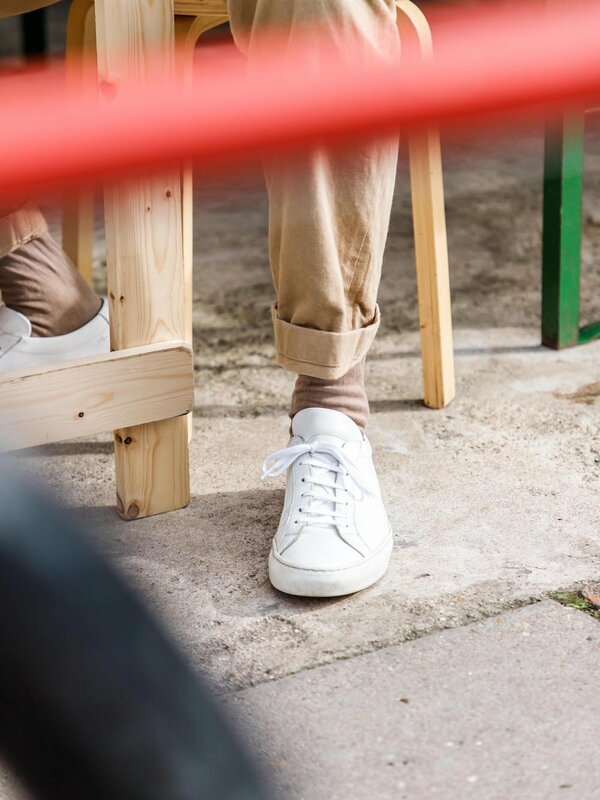 I’m looking to get a pair of cream chinos. It seems many brands which come highly recomended (eg incotex) are only available in cotton/elastane blends. Is this a new development? Do you have any experience of these cloths? The CP trainers, though unassuming and anonymous, piggyback on a heritage that belongs to others. It is worth considering that trainers as we know them are a century old. The first running shoe was made by Fosters (who supplied Harold Abrahams), the company then developed into Reebok. The issue is that at heart the trainer is utilitarian -made for a purpose. Attempts to translate it into fashion wear (as CP has done) are paradoxical as real trainers already exist in fasion – street fashion. One is real, the other, the CP, an imitation, rendered rather unstylish by the conservative approach (as in a brown leather trainer). Far better and more stylish to go to the source and buy a trainer that is real in its utilitarian purpose; the Reebok Club C vintage, the Adidas All Star, Puma Court Star and the best and original the Adidas Stan Smith/Haillet (Adidas invented the white leather tennis shoe in 1963, Rene LaCoste branded tennis shoe in 1958, the original tennis shoe being Supergra’s 2750 of 1925, Chuck Taylors preceded in 1923 and Keds in 1917 all based on the British invention – the plimsole of 1830). It is an example of classic street fashion wherein the cheaper, original version is better regarded and has more cachet than the later more expensive designer imitations. Whilst the consideration might be an anathema to some trainers have acted in a similar role to denim being matched to all forms of dress from athletic to formal – Chuck Taylors (perhaps due to the black colour) seem to span this breadth the best. Its not to everyone’s taste but for comfortable, informal, urban wear few things beat them – but I think the originals are better – like Ray Bans vs. every other Aviator that followed. Thanks, great history and point of view. I think the things that those styles miss, however, are the combination of slim last and quality materials. Stan Smiths are great, but they are too chunky to wear with anything tailored. And Allstars are slim, but their canvas splits after a year of use, while the leather versions use cheap skin. They just don’t age well, as in looking sleek and smart(er); they look great and beaten up as they age, which can be great with beaten up denim etc, or as a high/low combination, but not for the styles like number 1 here. I go into these designs points in part 1 of this series. Yes, I Have read the other articles…perhaps looking at the philosophy is helpful. All street wear, as a fashion genre, has evolved from a counter-culture position; Zoot suits, Teddy Boys, Greasers, Beatniks, Hippies, Punk, Hip Hop etc. – all have borrowed from utility (military, work clothes, sports clothing etc.). Because it is counter-culture street wear, in essence, is against formality and against the notions that bespoke espouses (formal, select, high cost etc. ), the creative aspect is in pulling together low cost incongruous items to complete a whole. To retain this aspect authenticity is required i.e. using the original item (think Timberlands in grunge, High tops in Hip Hop…). It is worth noting however that since the invention of fast fashion street wear, as a creative output of youth culture, is diminishing…and being supplanted by the received notions and products of the high street. Great site you have here. As suggested by a recent reader what about a shoe wardobe project as a follow on from the (very indulgent) dressing stand you collaorated on.? Done nicely and designed to maximise space it might even keep harmony in the home , i doubt if I am. alone in that my wifes wardrobe is a strict no go area! As for shoe makers i also use Cleverley without reservation but have recently been unfaithful ( or it feels that way), and am having a bepoke pair of saturday boots made by Fosters. – you should. definately check these boots out. I see neither you nor anyone else has responded to my previous comment which I think demonstrates that you may know more about clothes than I do but I know more about style than you do. This is a very informative and well-thought article. I still wear trainers from time to time. Personally, I think they kind of mellow down an over-all look to an outfit but still appear put together–like how you style the first outfit of a refined casual look. Zips are generally less smart, and I wouldn’t ever wear it undone, so it has less function. I prefer a clean look, the body tends to fit better, and it’s more true to vintage styles. Hi Simon, I wondered whether you had any insight into the question of maintaining white leather trainers? Have you used any leather whitening products that you would recommend? What would be your top recommendation for a good quality grey sweat shirt? The Real McCoy’s ? Sunspel ? Merz ? Hi, love the linen Brescianis mate, what colour are they?